It’s a march of the planets in the most beautiful way imaginable. 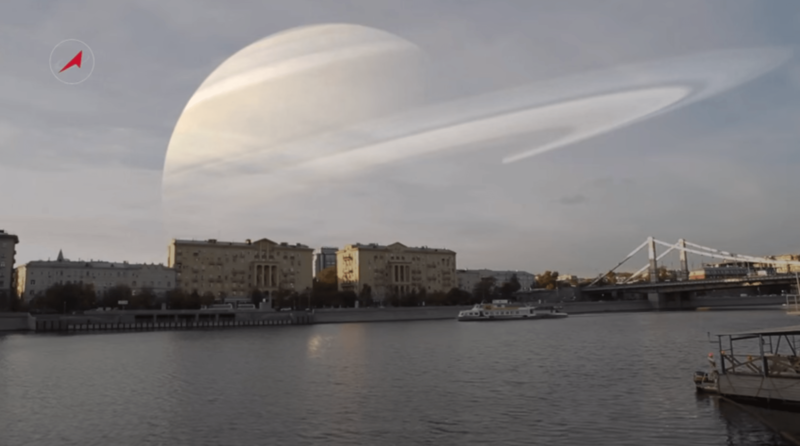 In a stunning video, the creative minds at the Russian Space Agency Roscosmos imagine how Mercury, Venus, Mars, Jupiter, Saturn, Uranus, and Neptune would appear in the sky if they were floating in space at the same distance from Earth as the Moon — 240,000 miles away. From largest to smallest, here’s a unique tour of the planets in our solar system as seen from Earth. 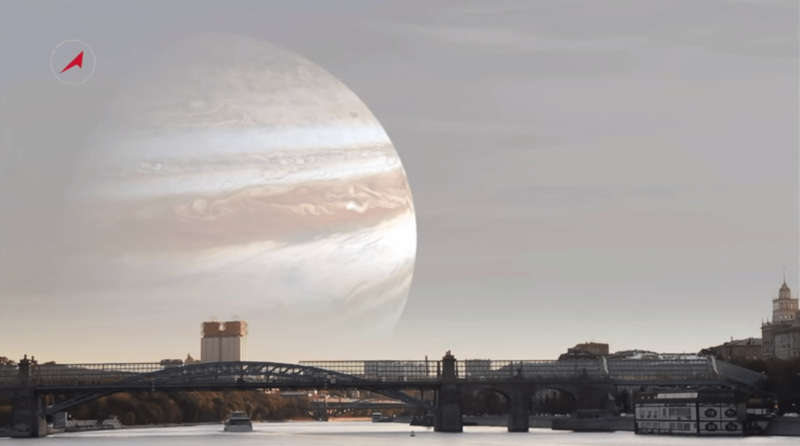 First up is Jupiter, which is so massive that you could fit all of the other planets plus their moons inside of it and still have room left over. The second largest planet in our solar system is also the most iconic, with a spectacular set of rings. Scientists are still uncertain of how Saturn got its rings. The upper atmosphere of Uranus has traces of methane, water, and ammonia gases, which give it that brilliant blue color. Earth is tilted on its axis at about 23 degrees, but Uranus is tilted on its side by 99 degrees. As a result, a day on the north and south poles of Uranus lasts 42 years, followed by a night of darkness that lasts another 42 years. The other blue planet in the solar system is also the farthest planet from the sun: Neptune. Neptune’s surface is a frigid -330 degrees Fahrenheit, making it one of the coldest planets in the solar system. (Uranus is slightly colder at -371 degrees Fahrenheit.) Underneath the blue clouds of Neptune are enormous storms that generate winds over 13,000 miles per hour. Venus is the closest planet to Earth and is sometimes referred to as Earth’s sister planet because it is almost exactly the same size. But when it comes to its environment, Venus is the polar opposite of Earth. The average surface temperature on Venus is over 850 degrees Fahrenheit, and the crushing pressure is equal to what you’d feel over half a mile beneath the ocean’s surface. Despite average temperatures that are akin to the coldest places on Earth and practically no atmosphere to speak of, Mars is the most hospitable planet in the solar system besides Earth. 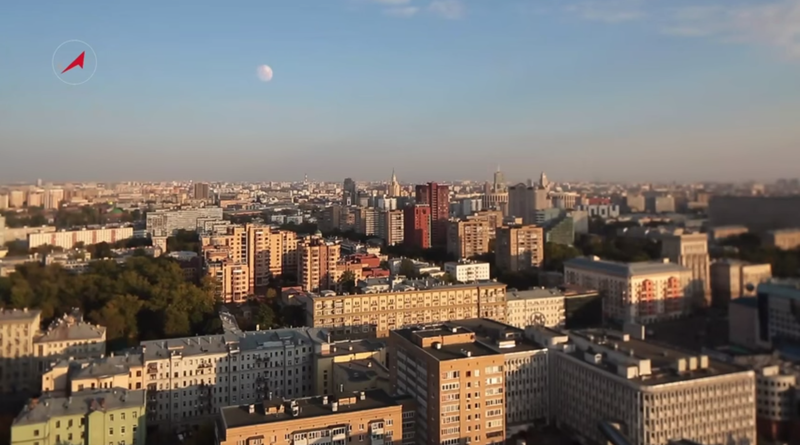 And as humans look to colonize other places in space in the future, Mars holds promise. The smallest planet in the solar system is also the closest to the sun: Mercury. Humans have known about this tiny planet for centuries. There are even reports of it by the ancient Greeks and Romans who named it after the god Hermes, who pulled the sun across the sky. One of astronomy’s most important tools, the Hubble Space Telescope, has never looked at Mercury and never will because the sun’s light could damage its instruments.